I love bananas in any way, shape or form. To paraphrase a childrens’ book “I can eat them here or there, I can eat them anywhere!” After I tried this cake many years ago, I misplaced the recipe and went to great lengths to get another copy. (I finally found it in the library, where they keep magazines on file for quite a while.) This cake is a favorite of my sisters’, and I know that she would welcome a piece any day! 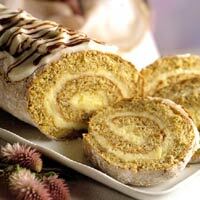 In this cake, the jellyroll and the filling are baked together and then they are rolled together. A thin icing is then spread over the cake. Lightly grease a 15 x 10 x 1-inch baking pan (cookie sheet). Line bottom with parchment paper. Set aside. Combine cream cheese and 1/2 cup sugar in a bowl. Beat with the paddle attachment of your mixer on medium until smooth. Add whole egg and milk; beat until combined. Spread in the prepared pan; set aside. In a small mixer bowl, beat egg yolks and vanilla on medium speed about 5 minutes or until thick and lemon colored. Gradually add the 1/3 cup sugar, beating till sugar is dissolved. Stir in banana and nuts. In a clean bowl, with clean beaters, beat the egg whites on medium speed until soft peaks form (tips curl). Slowly add the 1/2 cup sugar, beating on high speed until stiff peaks form (tips stand straight). Do not over beat. Fold yolk mixture into egg whites. Sprinkle the flour mixture evenly over egg mixture; fold in just until blended. Carefully spread the batter evenly over the filling in the pan. Bake for 15 to 20 minutes or until the cake springs back when lightly touched. Immediately loosen the cake from sides of pan and turn out onto a towel sprinkled with powdered sugar. Carefully peel off paper. Starting with narrow end, roll up cake using towel as a guide. (Do not roll towel into cake.) Cool completely on wire rack. spread top with cream cheese frosting. If desired, drizzle with chocolate syrup. Cream cheese frosting: In a small mixing bowl combine 1 1/2 oz cream cheese, softened and 1/2 teaspoon vanilla, beat with a mixer on medium until light and fluffy. Gradually beat in 1 cup unsifted powdered sugar. Beat in enough milk (1 to 2 tablespoons) to make a frosting of spreading consistency. Makes about 1/2 cup frosting. so excited to see this recipe! haven’t had it in years!!! it is the best!!! Hey just took the time to read the words, YOU REMEMBERED! im so touched.